In part 1, we had a quick tour of S/MIME, looking at signing and encryption of our message streams across a range of mail clients. Part 2 took us through a simple command-line tool to sign and encrypt emails, then send them through SparkPost. In this part, we’ll look at how the tool can be adapted to inject mail streams into on-premises platforms such as Port25 PowerMTA and Momentum. OK – let’s get started! Installing the tool, getting your keys etc. is exactly the same as before. When you’re using an on-premises email system such as PowerMTA or Momentum, you’re already responsible for setting up sending domains, DKIM keys etc. What we need to do now, is to provide some way of injecting the fully-formed S/MIME messages into your servers. PowerMTA supports various means of message injection, including a file “pickup” directory, SMTP, and an API. SMTP is the method used here. To illustrate the simplest possible setup, we’ll install the S/MIME tools on the same server as PowerMTA. We inject messages to the listener, which is open by default on TCP port 25, accepting local traffic only. Opened SMTP connection (plain) to localhost, port 25, user="", password=""
The message arrives quickly in the inbox and reports in Mac Mail as signed and encrypted. Use the PowerMTA DKIM Wizard site to create sending domain private key (in my case, mypmta.thetucks.com.pem) and public DNS TXT record contents. Set up the DNS TXT record, with a chosen selector. For example, I used selector pmta201811. Valid selector characters are defined here. Put mypmta.thetucks.com.pem file on the server in directory /etc/pmta . The DNS record checks out OK via MX Toolbox, and DKIM is now active. Momentum supports various means of message injection, including API and SMTP. SMTP is the method used here, towards a host already running Momentum. We’ll leave its configuration unchanged, as it already has a capability to accept incoming injections from other approved hosts. This is a smaller version of a production setup, where “generation” nodes and MTA nodes are separate, yet closely coupled via a private VLAN and load-balancers, carrying internal SMTP injection traffic. As before, we have the sender’s private key ( steve@thetucks.com.pem) and the recipient’s public key ( steve.tuck@sparkpost.com.crt) already present on the “generation” node. The first few lines of the message file match these addresses. We send the message from the “generation” node with exactly the same command as before, and the message shows up in the inbox. As you’d expect, S/MIME also happily coexists with Momentum’s DKIM signing. If you’re using SparkPost EU-hosted service then set SMTP_HOST as smtp.eu.sparkpostmail.com. The output below shows STARTTLS is used, along with the username and password. Opened SMTP connection (STARTTLS) to smtp.sparkpostmail.com, port 587, user="SMTP_Injection", password="****************************************"
The password is printed with substitute *** characters, so you’re not compromising the privacy of your key if someone’s looking over your shoulder. (530, b'5.7.1 Authorization required. Ref. These error messages are simply reported as-is from the Python SMTP library, hence the formatting. Which one’s faster – SMTP or API? Frankly, S/MIME is unlikely to be a high-volume use-case, but having the same tool with two output options was just asking for us to run a race! 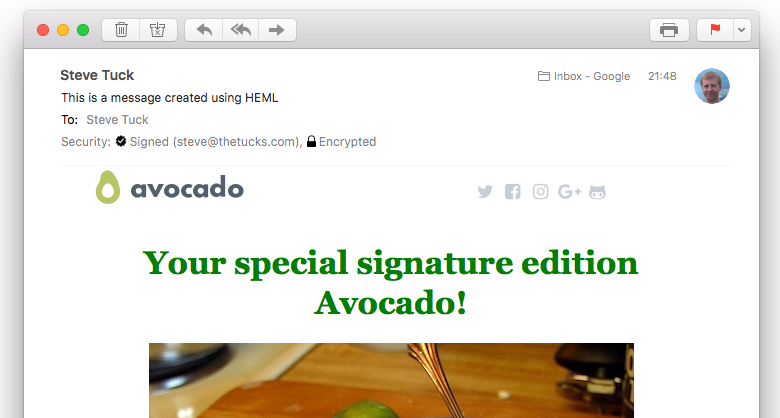 The “Avocado” email test file used here is approx 19KB. Repeating the tests 10 times via a bash loop showed the average times to be similar for SMTP and API, around 60 milliseconds per message, which is pretty fast. In this case, we injected from a medium EC2 instance in the same hosting region as SparkPost.com, which is a good way to keep network round-trip times low. Repeating this with a larger test file (577KB), the API took roughly 200 milliseconds, while SMTP took 280 milliseconds per message – still impressive for a file size 30x larger. Of course, your mileage may vary depending on location, internet congestion etc, but performance is unlikely to be an issue. If you really need maximum performance, a good starting point would be to launch a set number of concurrent injection processes/sessions as per our transmission best practices recommendations – e.g. from a supervisor task. 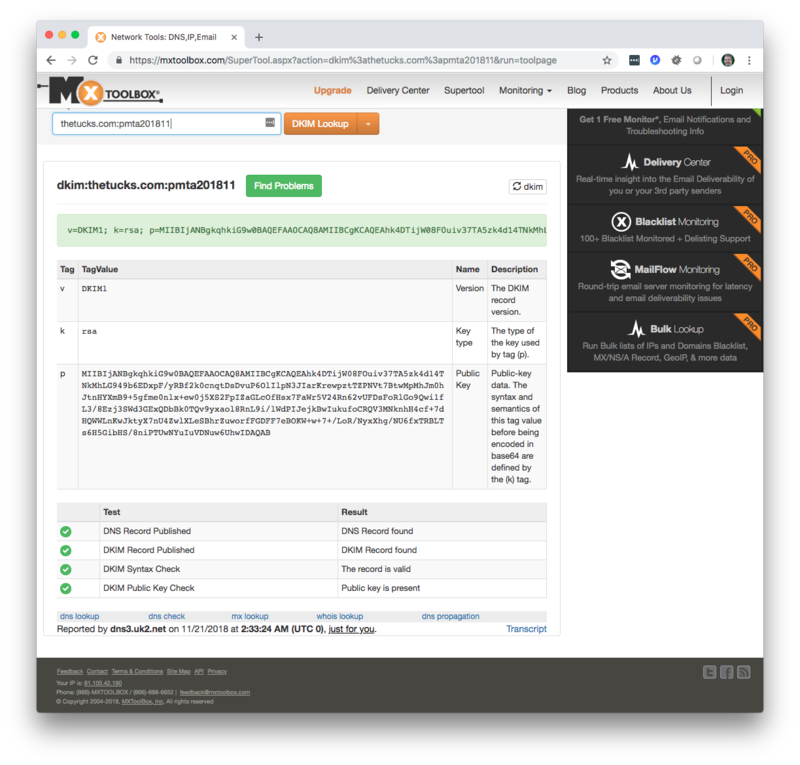 We’ve seen how the SparkPost API-based tool used in Part 2 is updated to support SMTP injection to support on-premises MTAs such as Port25 PowerMTA and Momentum in a variety of configurations, as well as with SparkPost. That’s it for now! Happy sending.